It has been said that all we do around here is eat, sleep and fly fish. Exactly, and we do all three extremely well with complete dedication and great enthusiasm. On 500 feet of St. Marys River frontage, you can take your rod and explore the river right out of your door whenever you please. 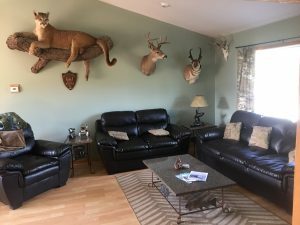 Our lodge is designed for your comfort. Your stay includes a plush and comfortable private guest room in a separate wing of the lodge. Our spacious rooms include two twin beds with their own full bathroom and privacy. The living room features ultra comfort with computer and satellite TV. With your own separate private entrance you may come and go to the river as you please. After a long day on the river you can sit on the deck and listen to the St. Marys River flow or indulge in a nice warm hot tub. You can expect a full and hearty breakfast each morning to prepare you for your full day of fishing. You may find it difficult to want to stop fishing to enjoy lunch but you will be pleased once you enjoy one of our shore side lunches. With Louies Italian background, he brings all of his families old Italian recipes to your meals. After a long day on the river its nice to come home to relax and indulge in an appetizer before your well prepared delicious Italian meal. You can be assured you will not leave hungry. You will be staying among friends. To ensure a relaxing stay and solitude experience, we only take six guests at any one time. Many of our returning guests book the entire house. 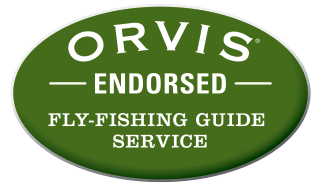 All of our bookings are done by advance reservation only with a fifty percent deposit by Visa, MasterCard, or invoice, all-inclusive fly fishing packages only. Please visit our customer comments section for further information on The Guest House.